The center of Ferrara is dominated by the Castello Estense. It was pleasingly castle-like, with a big moat, dungeons in the basement scrawled with the graffiti from centuries of prisoners, and elaborate palatial rooms for the ducal d'Este family above. It didn’t seem very appealing to us to build your bedroom right above the cell where you’d imprisoned your wayward wives and children, but we conceded that none of us had ever been dukes. At lunch we were served more of those terrible local breads by a very condescending waiter, but otherwise enjoyed local favorites like pumpkin ravioli. We walked around town in the heat for another few hours to see the Palazzo Diamante (named for its white diamond wall pattern) and sample gelatos of varying quality by the Duomo. Over the next couple weeks as we settled down in sleepy Bologna, I figured I might as well take advantage of the speedy Italian trains to explore more of the surrounding towns. I became adept at covering each one - a palazzo here, a piazza there, lots of churches, some gelato, and I'd call it a day. Ted discovered an interesting fact, which was that you can tell a bit about each city by the shape of its crenellated buildings. Those with squared crenellations were Guelphs, supporting the Pope. Those with the little split-top crenellations were Ghibelline, supporting the imperial party. In some cities, like Bologna, there are buildings with both styles reflecting changing political persuasions over the years. Ravenna was one of our stops. 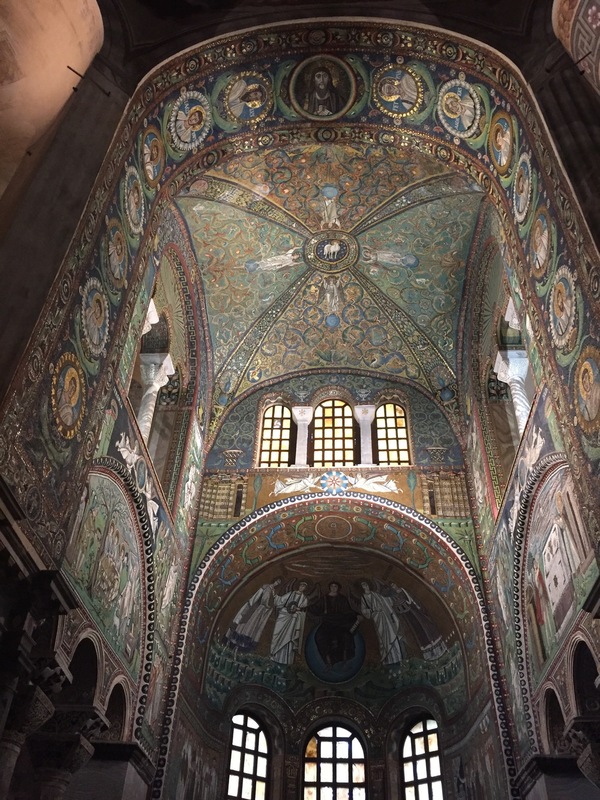 It’s famous for the elaborate gilded mosaics that depict Byzantine Emperors in its 1,500 year old churches. We enjoyed those, and also walked past Dante’s tomb. They love Dante here. 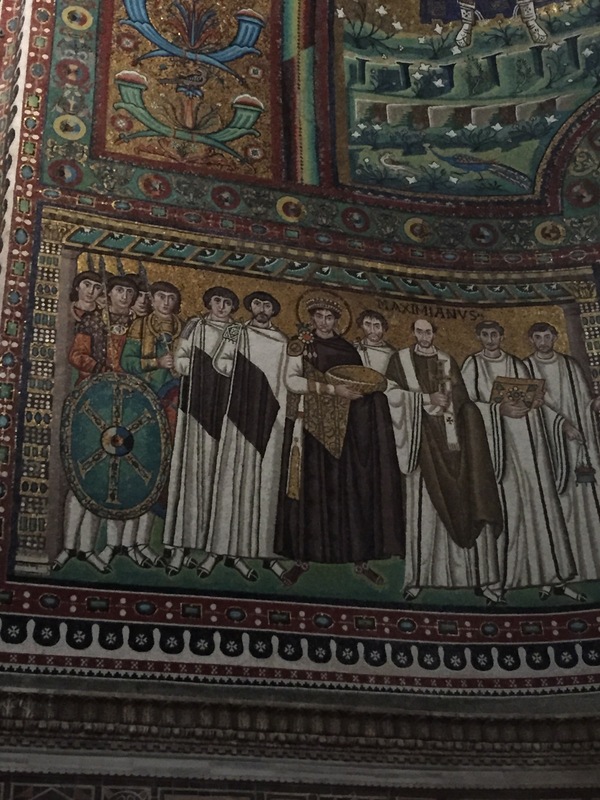 His body was repeatedly stolen and moved around the country for centuries until it finally landed back in the marble mausoleum in Ravenna that was decorated mostly with the heraldic tags of the pope who commissioned it. 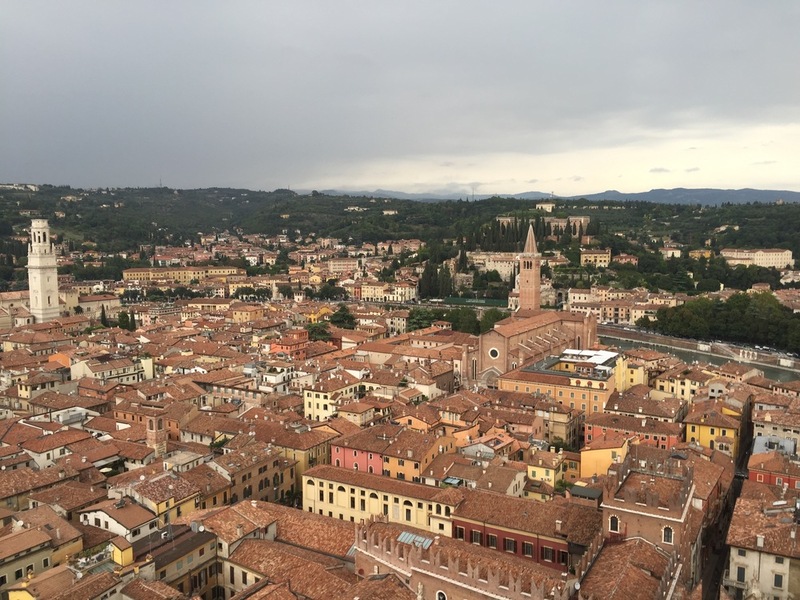 Next was Verona, land of Romeo and Juliet. I took myself out for a fancy lunch, ducked out of an afternoon shower in a quiet cloister, and tried to avoid the crowds of German tourists clamoring to see what was supposedly Juliet’s house. It’s a typically beautiful town, though, and I got a great view of it from the top of the Torrei dei Lambert. 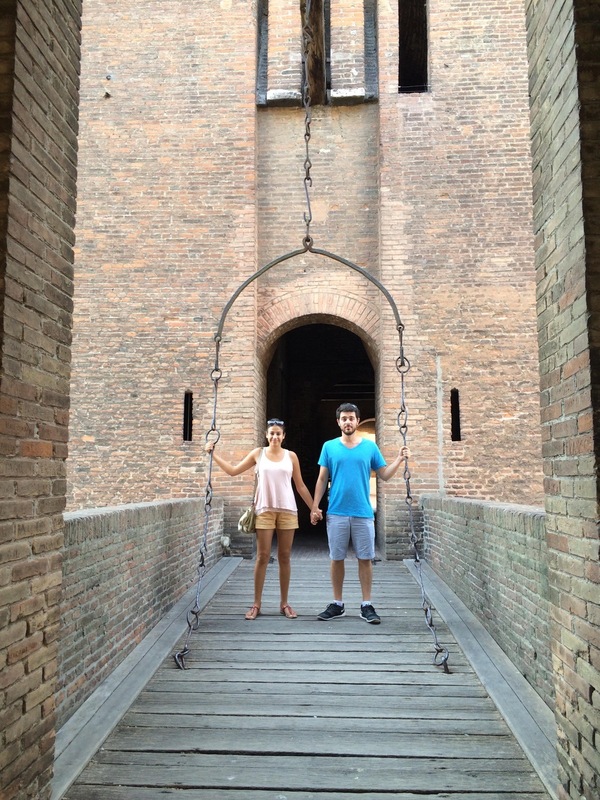 Continuing my tour of Shakespearean locations, I travelled to Padua the next day. While less outwardly gorgeous than Verona, it was had many fewer tourists, and was a very pleasant place to wander. 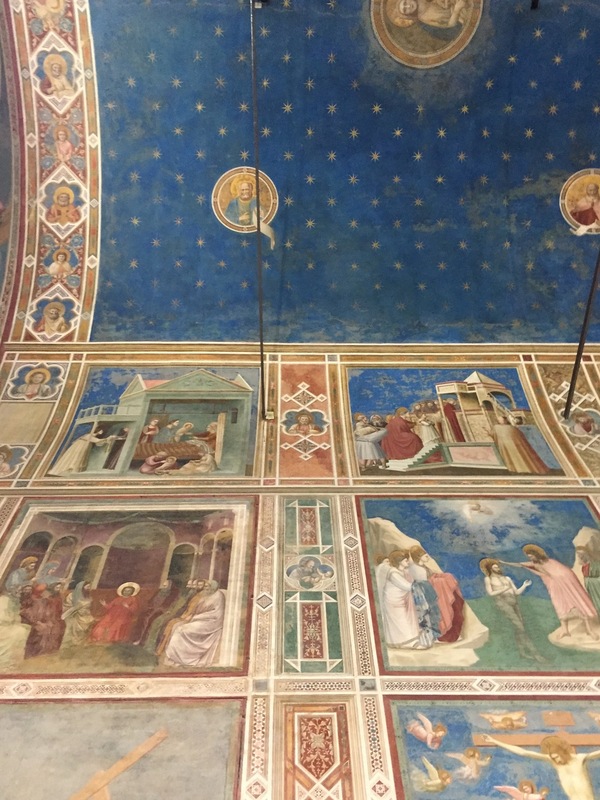 It’s home to Giotto’s Scrovegni Chapel. I wished Ted was with me to explain what all the different Bible stories he was illustrating on the ceiling. 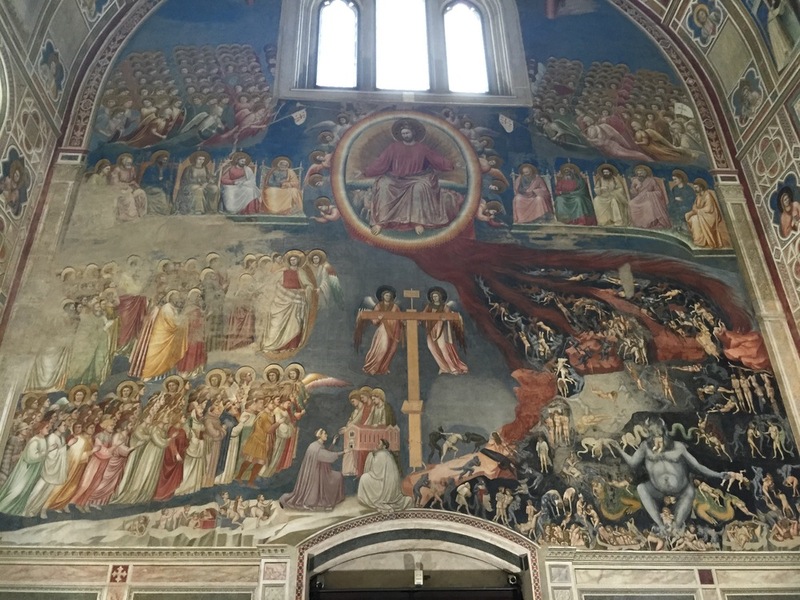 I also went to the Basilica di Sant Antonio, which has the body of St. Anthony. What struck me most was how it was both a massive and beautiful tourist destination, but also a well-used parish church. There were people touching St. Anthony’s tomb and praying, visiting the various bits of Saints housed in gold reliquaries in the back, and receiving blessings from cassocked priests.